What is the Death Ceremony among the Sikhs? On the death of a Sikh, his relatives and friends are informed, so that they may join the funeral ceremony on whatever day and date is fixed for the cremation. In foreign countries, a date and time is given by the crematorium authorities. As soon as the people gather for the funeral, the dead body is bathed then dressed in clean clothes with the five articles of faith of the Khalsa, and placed on a wooden frame or palanquin. The people form a procession and sing hymns as they carry the body to the cremation ground. In the West they form a motorcade and drive to the crematorium. No wailing or beating of the chest or breasts is allowed, for death is the natural end for every person, instead the congregation and family chant “Sat Naam” (True is His Name) and “Waheguru” (Wondrous Lord). “Kabeer! Why cry at the death of a Saint? He is just going back to his home. Then the Ardaas (congregational standing prayer) is recited, this seeks a blessing for the departed person. Then the nearest relation to the deceased lights the funeral pyre, electricity or gas, whichever is used for the cremation. When the ashes are collected they should be disposed of by throwing them into running water or the sea. No memorials or monuments may be erected at the place where the last remains of the deceased were disposed of. “Kabeer! Death of which the world is afraid of, gives me nothing but joy! The paath (reading) of the Holy Scripture should be completed within nine days. On the tenth day, the relatives and friends of the family gather for the “Bhog” ceremony, at which the singing of hymns, and the last five pages of Sri Guru Granth Sahib Ji are read. After the Bhog, Raamkali Sadh (This composition which is based on call of death is on page 923 of Guru Granth Sahib Ji) is recited for the benefit of the family of the deceased. The Gurus emphasised the remembrance of God’s name as the means of consolation for the bereaved family. After Ardaas and a Hukam, Karah-Parshaad is distributed among those present. Sometimes Langar (Free food) is also served, though it is not compulsory. Presents are then sometimes distributed to the grand children and donations are announced for charities or religious organizations. Sometimes another small ceremony is marked in accordance to cultural traditions. This is called Dastar-bandi (turban tying). The eldest member of the family is declared as the new Head of the family and given a turban ceremoniously. This is a token of his new responsibility for looking after the family and estate of the departed person. They are then regarded as the new chief of the family, responsible for the care of the children and other dependants of the family. The video shows the deceased person’s body being brought to the home of the family after it has been bathed and dressed up. Sikh hymns are sung followed by an Ardaas (standing prayer) seeking permission to take the body to crematorium. 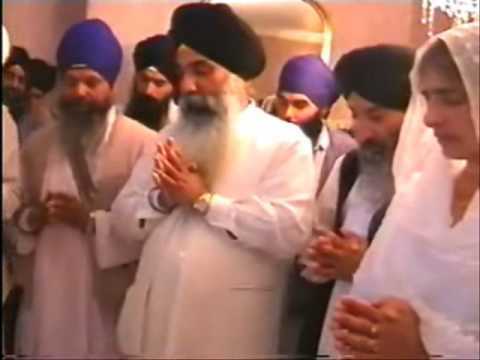 As the body is lifted and taken to the crematorium the congregation chant prayers reflecting how a devout Sikh leaves to go to the Lord’s Court when he or she dies. « What is the Sikh initiation – Amrit? Do we do bhog prayers every year after a person dies?